Even tho millions of shoebox gifts are delivered each year many people still ask "What is Operation Christmas Child?" 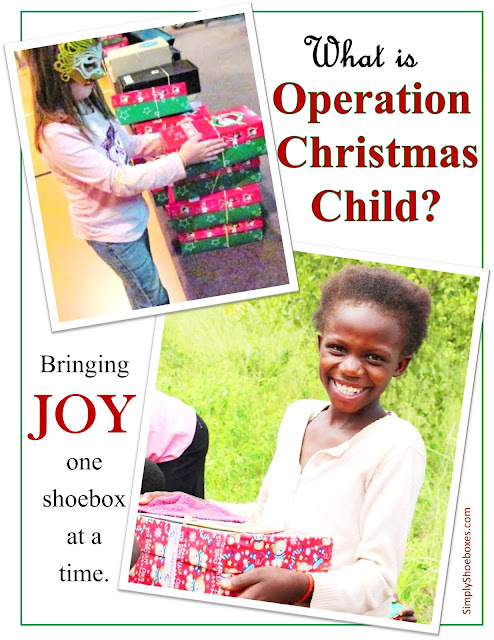 It is simple: OCC collects shoeboxes packed with gifts each November for children in crisis around the world. They then deliver them, bringing joy to children around the world who otherwise may have no Christmas at all. Our family has participated as long as Samaritan's Purse (an international Christian relief agency) has been doing it since 1993 (I think we missed one year when we were moving). Some years we do a few and some we do dozens. It is a great project to teach children to help others: find an empty shoebox, add toys, hygiene items, school supplies and more. of my shoe box girls in Latvia. We have enjoyed the opportunity to volunteer in the Operation Christmas Child processing center at their headquarters in Boone, NC as a family and have also enjoyed corresponding with some of the children who have received our shoe boxes. We always include our address in case the child has the ability to write to us. The last couple of years we have included our email. One year two sisters in a hospital received the two boxes my daughters sent. They were able to correspond for a few years after receiving the letter thanking them for the shoeboxes. It is so nice when we receive a letter and a photo from the child receiving the box. It is a small percentage of the number we have sent, but has been such a special treat when we have. no toothpaste or candy allowed. If you have any interest in starting a tradition with your children or grandchildren (or by yourself) of giving to a child in crisis at Christmas, OCC is a great program with which to do it. It is simple and can be very personal by including a letter and a picture. Often in the videos of the children receiving the boxes it is the photograph that they are most thrilled with. I remember seeing a little Spanish speaking fellow waving the photo shouting "amigos, amigos." Operation Christmas Child has collection centers throughout the US or the shoebox can be shipped directly to their Boone address. You can learn how to pack a shoebox and find a collection center near you by visiting the OCC website (the local collection centers--usually churches--are not listed until around September each year. But they are in every state and more than likely there should be one in driving distance--perhaps contact OCC to see if they can let you know if there have been ones near you in past years). Collection week is the week before Thanksgiving each year. You can also keep up with Operation Christmas Child on Facebook. Images courtesy of Samaritan's Purse. What a fantastic thing to do Cheryl! I am sure you will soon reach your goal of 100 shoe boxes with all the deals you are able to find. What a wonderful thing you are doing, Cheryl!!! I've just found a similar organisation in Australia. It's run to provide love and hope to communities affected by Australian disasters through small boxes of essential and luxury items. Pam, don't just love what you can do thru a shoe box? I know you will enjoy filling boxes. Love the idea of the one you found. I know OCC is worldwide--several different countries pack boxes, including Australia.